October 13, 2016 Vancouver, BC - El Niño Ventures Inc. ("ELN" or the "Company") (TSXV: ELN; OTC Pink: ELNOF; FSE: E7Q) EL Nino Ventures would like to announce that it has executed an asset sale agreement with Puma Exploration (PUM:TSX-V) to relinquish its 32.1% interest in the Murray Brook Zn-Pb-Cu-Ag Volcanogenic Massive Sulphide ("VMS") deposit located in the Bathurst Mining Camp ("BMC") of northern New Brunswick. The Murray Brook property consists of Mining Lease 252 and contiguous Mineral Claim Block 4925 (245 claims) located 11 km west of the producing Caribou Mine, which is owned and operated by Trevali Mining Corporation. The aforementioned transactions are expected to close on or about November 15th, 2016. El Nino's joint venture partner Votorantim Metals Canada Inc. on the Murray Brook Project has also optioned their total interest of the Murray Brook Project to Puma. Harry Barr, Chairman and CEO comments; "We are pleased with the terms and conditions of our sale of the Murray Brook asset. Given the fact that our company had a minority position in the project, we believe that the proceeds from the sale will allow the company to acquire new projects and focus on our existing assets and allow management the funding needed to acquire key assets in the precious metals space." C$50,000 non-refundable deposit to be paid 10 days following the waiver of the ROFR from El Nino. This deposit becomes binding on receipt of the waiver of the ROFR from El Nino. El Nino will receive a laddered Net Smelter Return on Production (NSR) starting at 0.25% at a zinc price of US$1.04/lb and increasing, in increments of 0.25%, to a maximum of 1.75% above US$1.50/lb Zn in relation to 32% of the production from the Murray Brook Property, which includes the Mining Lease and the Camel Back claims, for the life of the Murray Brook deposit and any new discovery made on the total project. Votorantim Metals Canada Inc. will retain title to the project as security until the assumption of the environmental liability has been completed by Puma and Votorantim Metals Canada Inc.'s and El Nino's liability is released by the Government of New Brunswick. El Nino will continue to maintain its current interest in the Bathurst Zinc Project - Bathurst Option Joint Venture (BOJV) also located in the Bathurst Mining Camp. June 5, 2013. Vancouver, BC; El Nino Ventures Inc. ("ELN"and the Company") (TSX.V: ELN; OTCQX: ELNOF Frankfurt: E7Q) is pleased to announce the results of an NI 43-101 Preliminary Economic Assessment ("PEA") for the Murray Brook polymetallic massive sulfide deposit, New Brunswick (the "Project"). The results of the PEA demonstrate the potential technical and economic viability of establishing a new mine and mill complex on the Murray Brook property. The projected cash flows indicate an after-tax NPV at a 5% discount rate of $96.4 million, an IRR of 11.4%, and a payback period of 5.4 years (see table 1). An NI 43-101 Technical Report will be filed on SEDAR within 45 days of the date of this press release. Harry Barr, ELN's Chairman & CEO commented, "The results of the PEA clearly indicate that there is an indicative basis for a mining project at Murray Brook. There is excellent potential to further enhance the projected economics of the project, through continued refinements in metal recoveries as well as the potential to augment existing resources by achieving an exploration success on the adjacent Camel Back claims. With forecasts of increased metal demand and dwindling supply, the positive PEA results for the Murray Brook project provide ELN shareholders with the potential to benefit from the predicted upward trend in zinc prices over the next few years". Unless otherwise noted, all amounts in this press release are expressed in Canadian currency. The PEA is prepared for 100% ownership of the project revenues and expenditures. As noted below, ELN holds a 35% interest in the project. The PEA includes Inferred mineral resources that are considered too speculative geologically to have the economic considerations applied to them that would enable them to be categorized as mineral reserves, and there is no certainty that the PEA will be realized. The PEA was prepared by P&E Mining Consultants Inc. and the full results of the study will be disclosed in a NI 43-101 Technical Report within 45 days of the date of this press release. The PEA was prepared under the supervision of Eugene Puritch, P. Eng. of P&E Mining Consultants Inc. Mr. Puritch is an independent QP in accordance with NI 43-101 and has reviewed and approved the technical information in this release. The main conclusions from the PEA follow below. (1) Potentially economic portion of the mineral resource estimate which are not mineral reserves do not have demonstrated economic viability. This estimate of mineral resources may be materially affected by environmental, permitting, legal, title, taxation, sociopolitical, marketing, or other relevant issues. (2) The quantity and grade of reported potentially economic Inferred resources in this estimation are uncertain in nature and there has been insufficient exploration to define them as an Indicated or Measured potentially mineable mineral resource and it is uncertain if further exploration will result in upgrading them to an Indicated or Measured potentially economic mineral resource category. (3) The potentially economic portion of the mineral resource in this press release was estimated using the Canadian Institute of Mining, Metallurgy and Petroleum (CIM), CIM Standards on Mineral Resources and Reserves, Definitions and Guidelines prepared by the CIM Standing Committee on Reserve Definitions and adopted by CIM Council. The PEA assumes the start of the open pit mining operations at an average annual process plant production rate of 2,000,000 tonnes per annum over a mine life of approximately 9.5 years. The envisaged mining operation is a conventional open pit. Mining operations will reach a sustained total annual material movement of 11.6 million tonnes using 11.5 m3 diesel hydraulic excavators, 90 tonne haulage trucks, and track mounted diesel powered drill rigs with up to 100 mm diameter blastholes drilled on 6 metre high benches. The mined material will be processed at a new 6,000 tonnes per day flotation plant located on the Project site. Three concentrates will be produced: 1) copper-silver; 2) lead-silver; and 3) zinc-silver. It is anticipated that the concentrates could be processed at the nearby Belledune Smelter or other suitable facilities. The proposed Murray Brook Project mill and mine site is ideally located on the access road to the open pit area. The proposed processing plant site is located on a ridge overlooking a valley about 100 metres below. Several lateral ridges form natural containment dykes for at least two sides of a tailings management facility. Power to the site will be supplied by a 12 km long transmission line connecting to the Caribou Mine site and provincial grid. The labour force for the construction and operation of this project is anticipated to be drawn from the Bathurst area. The labour pool in this area is highly skilled and experienced in construction projects and mining operations. 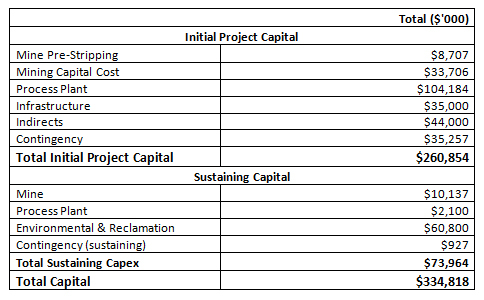 Capital costs are categorized as Initial Project Capital and Sustaining Capital. Initial Project Capital consists primarily of mining equipment, process plant and ancillary plant construction, initial tailing storage, facility construction, an allowance for water treatment, and local infrastructure. Sustaining capital consists of further additions to mining equipment during production and environmental and closure costs. Metal prices used in the PEA are based on the April 30, 2013 three year trailing prices which are listed in Table 5 below. Further technical studies on the Murray Brook Project will focus on additional metallurgical studies designed to evaluate potential techniques of improving metal recoveries. The first step is a small pilot plant project proposal to test three to five tonnes of drill core material. The largest impact on the potential value of the Murray Brook Project is likely to be achieved by increasing the mineral resource base available for mining, thereby increasing the mine life and (or) annual mill throughput. Excellent potential exists for additional discoveries along and adjacent to the favourable geological horizon which extends from the former Restigouche Mine to the west of the Murray Brook deposit deposit to Trevali's productive stratigraphy could significantly increase the scale of the Murray Brook Project prior to development. A 2,000 metre exploration program is proposed to drill test five priority geophysical and geochemical anomalies this summer. The PEA was prepared under the supervision of Eugene Puritch, P. Eng. of P&E Mining Consultants Inc. Mr. Puritch is an independent QP in accordance with NI 43-101 and has reviewed and approved the technical information in this release. The information in this release was reviewed by Dr. William Stone, Executive Vice President of Exploration of ELN and a Qualified Person as defined by NI43-101. 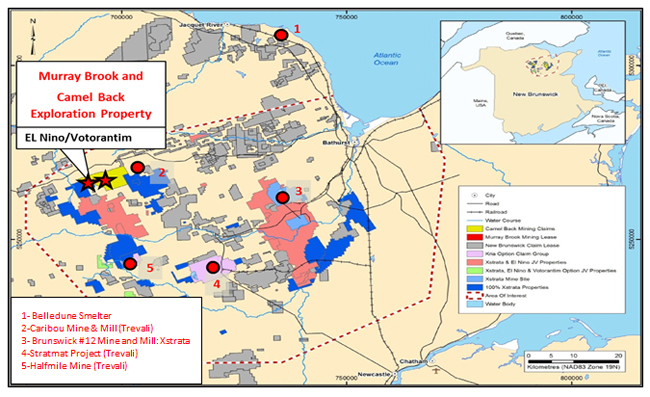 Murray Brook property is located 60 km west of Bathurst and a portion of the property is underlain by the Murray Brook polymetallic massive sulfide deposit. The property is supported by excellent nearby infrastructure, including paved roads, grid electricity and communities to provide goods, services and skilled labour (Figure 1). ELN and Votorantim Metals Canada Inc. "VMC" (who is the operator of the joint venture project) currently own 70% of the project, of which 35% is held by each of the two parties. Under a purchase agreement signed by VMC on August 28, 2012 with Murray Brook Minerals and Murray Brook Resources Inc. (collectively the "Owners"), VMC acquired the right to purchase the additional 30% of the Murray Brook Project from the Owners. The purchase agreement between VMC and the Owners provides for a series of staged payments totaling $6 million over a five year period and provides for a 0.25% NSR payable to the Owners after one year of commercial production. VMC provided ELN the option to purchase an additional 15% in the project as required by an underlying Amending Agreement dated September 30, 2010 between Xstrata Zinc (now Glencore Xstrata PLC), VMC and ELN (see reference to the Tri-Party Agreement immediately below). ELN did not elect to exercise the option and consequently at this time the Joint Venture remains at VMC 65%: ELN 35%. To date, more than 28,000 metres of drilling has been completed with encouraging results. In February 2012, NI 43-101 resource estimation was announced (see news release). The Technical Report is filed on SEDAR.com and also available on ELN's website. The new Preliminary Economic Assessment Report, PEA, will be filed on SEDAR within 45 days of the date of this press release. Consists of an initial 4,712 claims in the Tri‐Party Agreement with Xstrata Zinc (now Glencore Xstrata) and VM Canada, whereby VM Canada may incur exploration expenditures of $10 million over a period of 5 years to earn a 50% interest. VM Canada may further increase its interest to 70% by spending an additional $10 million over two years. Drilling and further exploration activities have been planned for 2013. Technical details in this news release were provided by VMC whose professional geologists conduct operations consistent with mineral industry best practices. VMC accepts no responsibility for this news release or any inferences made from the technical details provided herein. VMC is a subsidiary of Votorantim Metais is a company that is part of the Votorantim Group that was founded in Brazil in 1918. The Votorantim Group operates in twenty countries and has over 40,000 employees. Votorantim Metais is the largest electrolytic nickel producer in Latin America and one of the world's leaders in the production of zinc, aluminum and nickel. Votorantim Canada Metals Inc. in conjunction with Glencore Xstrata PLC and El Nino Ventures is operator of the Bathurst Option and Joint Venture which is actively exploring for base metal deposits within the Bathurst Mining Camp.